The Percival Prentice was conceived at the end of WW2 as an advanced side-by-side trainer to replace the Tiger Moth and Harvards then in service with the RAF. The prototype flew in 1946, powered by a DH Gypsy Queen engine, similar to that that powered the much lighter Tiger Moth. A resemblance can be seen around the front engine cowling. In its rash economies forced on it after the end of the war, the UK air ministry made similar mistakes to those it made after WW1, and anyone could have forecast that the underpowered Prentice could have only ever have been a stopgap, and consequently, was never a great achiever. 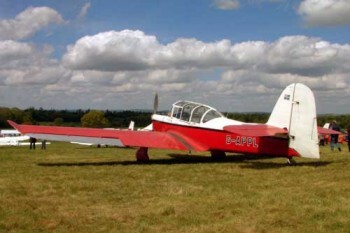 The Prentice had to be replaced by the early 1950s with the Percival Provost and the Boulton Paul Balliol. Nevertheless, the Prentice was a roomy aircraft, and equipped a number of Flight Training Schools from 1947-1952. It was sold to Argentina and to India, where it was manufactured under licence, and several are still flying today. An interesting bit of trivia is that the remaining airworthy Prentices in the 1960s had the distinction of being converted to double for Ju-88 Stukas in the 1966 film, "The Battle of Britain".